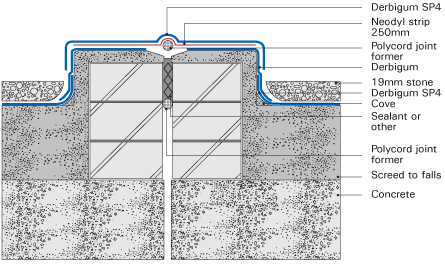 One layer Neodyl expansion joint membrane heat fused over bitumen primed expansion joint. Expansion joint to be pre filled with polyurethane jointing compound followed by a suitable diameter Polycord forming a raised bump above the expansion joint. One layer of Derbigum SP4 heat fused over the Neodyl to finish. A metal capping can be detailed above the Derbigum SP4 to architects specification according to the final trafficable use over the joint. Waterproofing to be installed by an Approved Derbigum Contractor.